Florentine jewelry is renowned for its workmanship and artistry which dates back over 800 years. 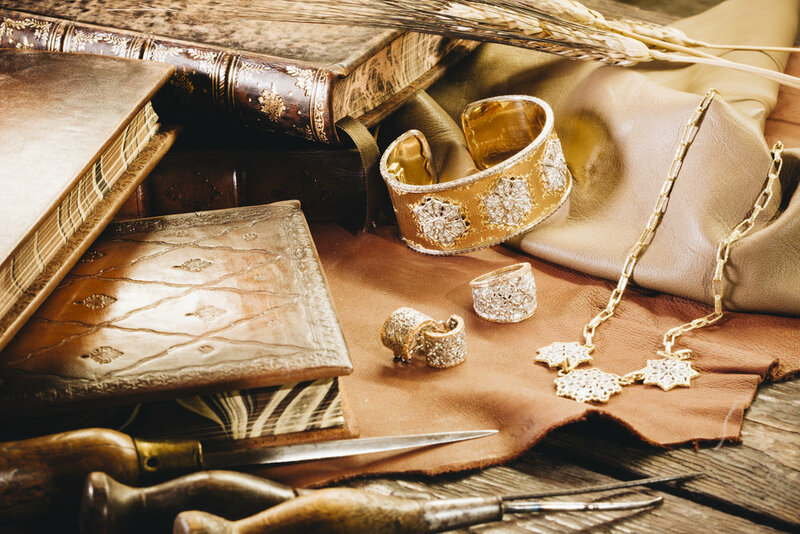 All pieces are handmade and unique, and all are crafted in premium 18kt Italian gold. These are once in a lifetime investments. The first currency used throughout all of Europe, the Florian was first minted here in 1253 and is claimed to be the good-luck charm that has brought Florence such eternal prosperity. Now available in necklaces, pendants, rings and earrings. Buy one for good luck! Inspired by the beautiful stained glass windows that decorate the Basilica of Santa Croce, this 18kt gold collection is adorned with gleaming semi-precious stones. Every item is hand made and completely unique. This style was developed through the Renaissance and is still a Florentine classic.